As you can guess, I am a poor neglected dog. OK, so my mom is home all day almost every day. And I get to go running almost every week with my Uncle Jim, not to mention scarfing treats from the building manager and getting free massages from almost everyone in the neighborhood. 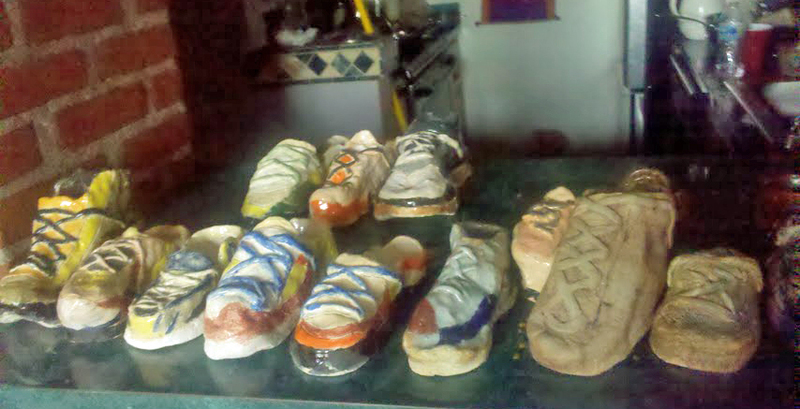 Here are some of the sneakers she’s been making in her ceramics classes at the Clay Studio. She’s gotten marginally better since I had to help her out at the studio in Seattle. But I think she’s found her groove. Ahem. In case you haven’t noticed I get to skip the whole shoe thing with my paws. But you’ll see photos of sneakers here. My mom has considered selling them online, which would mean more money for my treats. That’s a GOOD thing. Notice how Pumpkin, our newest adopted cat, has nudged her way into the background, occupying center stage as usual. 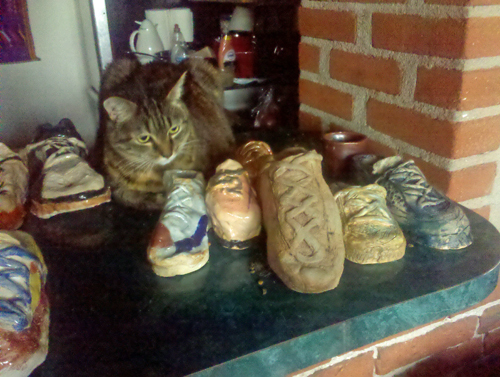 That’s because her food area has been turned into a sneaker display. Fortunately Pumpkin is so food-oriented she’d eat even if she just had three inches of space. Speaking as a retired potter (which I did for about 15 years in the 70’s and 80’s) tell her to keep working on the sneakers…one day your Mom will have an epiphany about the sneakers, and she will hit on a unique glaze, or something that will make them unique, and then! you will be happy she was working so hard on them. Thanks again, Bobbie! My mom’s teacher thinks they are unique in the ceramic but I will show her your post and maybe she will work harder! ANyway my mom doesn’t have much talent, as you can see. Just a lot of enthusiasm. You were probably more talented. But as they say, it keepsher off the streets. Now Now Now! Gracie, with pottery, practice makes progress. And suddenly the potter emerges from the other side happy that she perservered…has more to do with grit and determination and then after that even more progress. Seems to go on for years, and all that inspires the potter to continue. She could take a print of your paw, and then bisque it, and then put clay in it, and bisque that and it would be a real 3 D print of your actual paw! I bet you’d like that!